Capitellum articulates with the radial head (lateral). Trochlea articulates with the olecranon (medial). 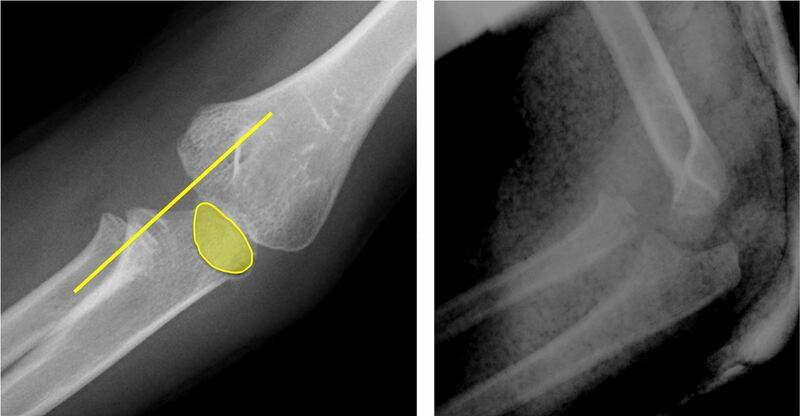 Anterior and posterior fat pads are located within the coronoid and olecranon fossae respectively. 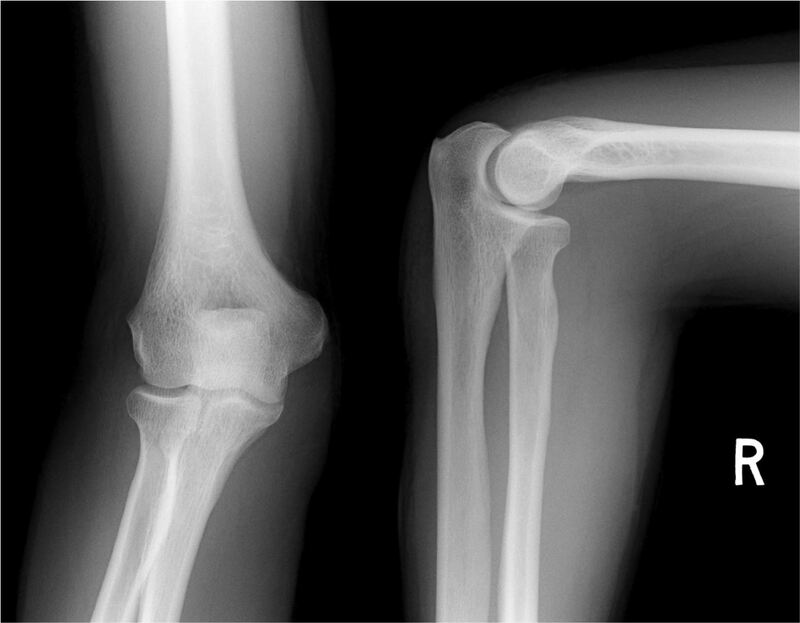 An intra-articular fracture will cause leakage of blood and marrow into the joint to give a joint effusion. This displaces the fat pads away from the bone. Normal fat pads do not exclude a fracture. 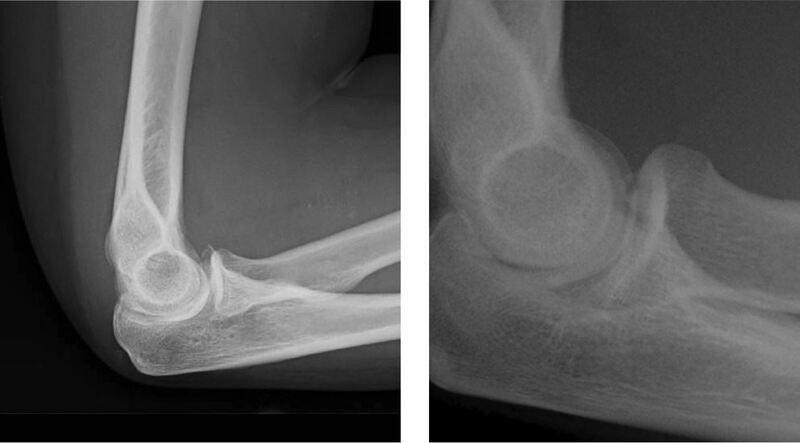 Injury to the elbow may rupture the joint capsule enabling the haemarthrosis to drain from the joint. Consequently raised fat pads won't be visualised. 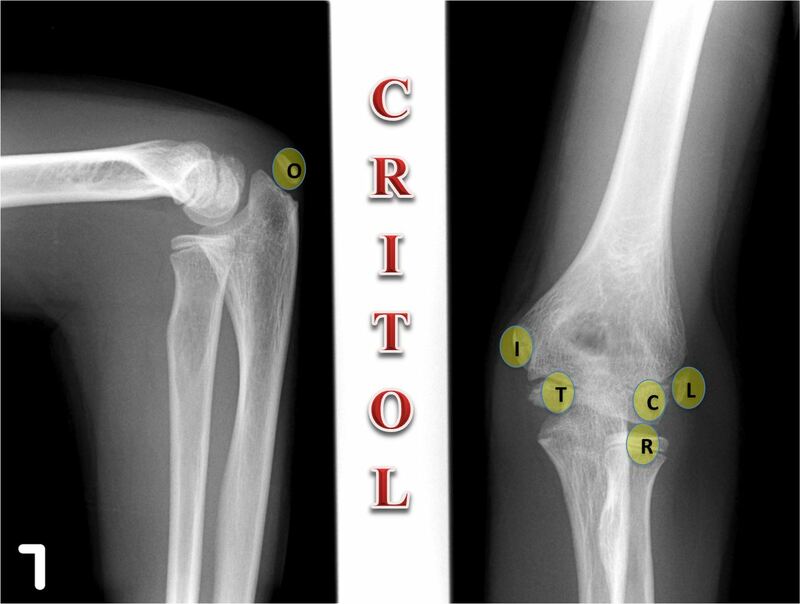 At birth, the distal humerus and proximal radius and ulna consist of cartilage, which contain no ossification centres. Six centres of ossification progressively appear in a consistent order until the age of 12 years. 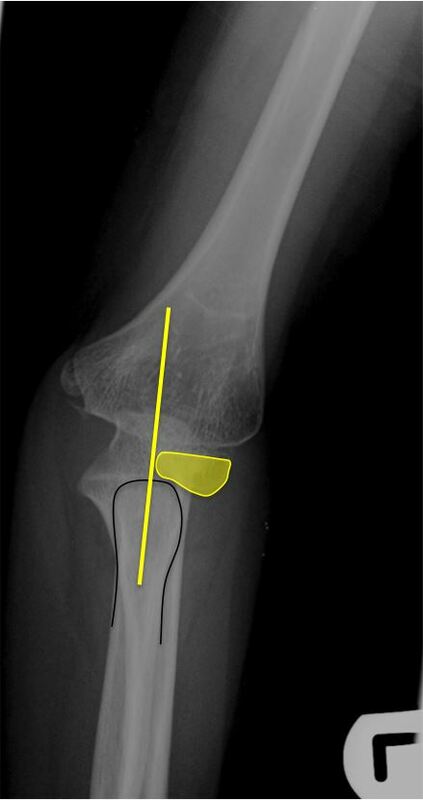 The ossification centres enlarge, and fuse between the ages of 14 and 16 years (except the medial epicondyle, which fuses last at 18 to 19 years). The centres appear earlier in girls than in boys. 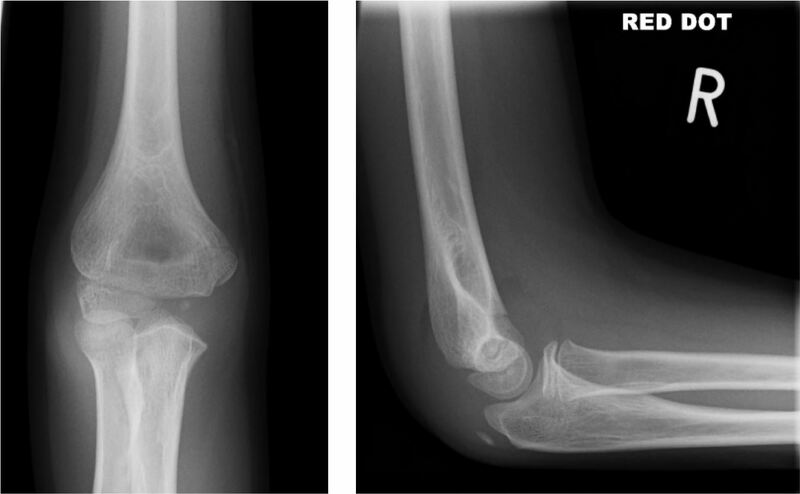 The timing may vary, but the sequence of appearance is always the same, a fact which is invaluable when identifying internal (medial) epicondyle avulsions. The apophysis for the lateral epicondyle fuses with the capitellum before fusing with the humerus. The trochlea often ossifies irregularly. 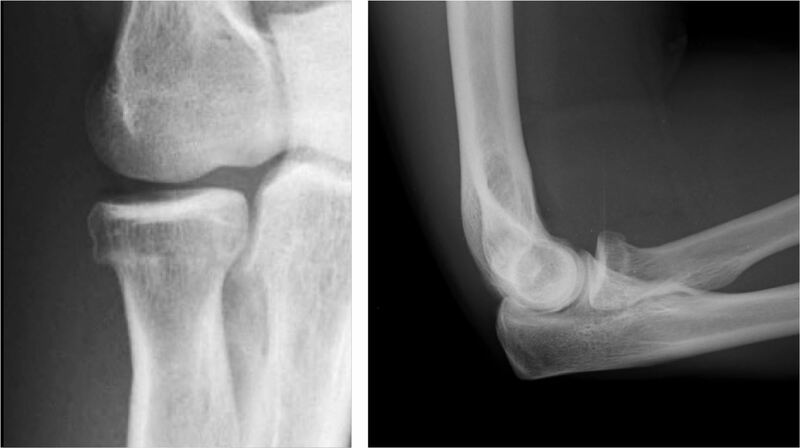 The apophysis for the olecranon may simulate a fracture, particularly when it is starting to fuse. 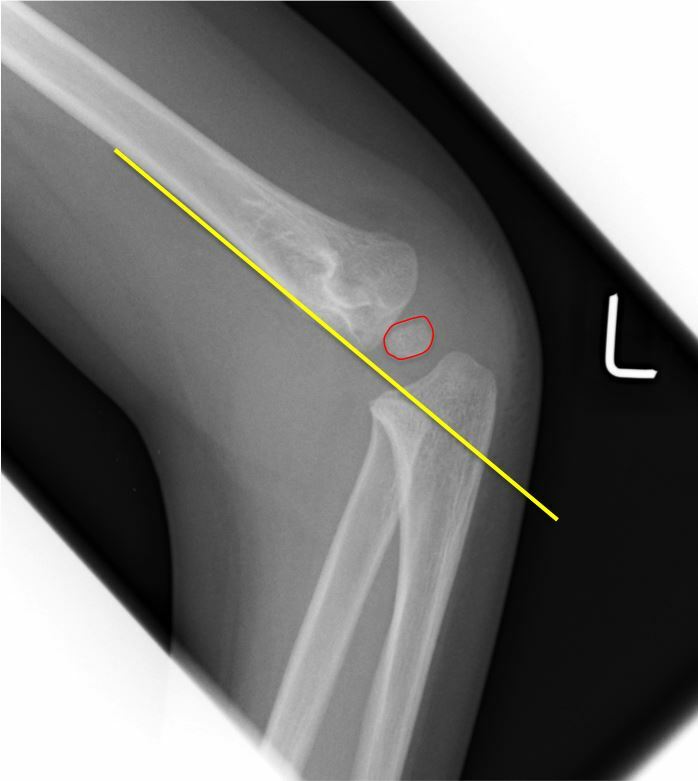 When assessing the paediatric elbow, always locate the ossification centres. Complications such as vascular or nerve damage arise from widely displaced fractures, as the brachial artery and median nerve both run anteriorly. 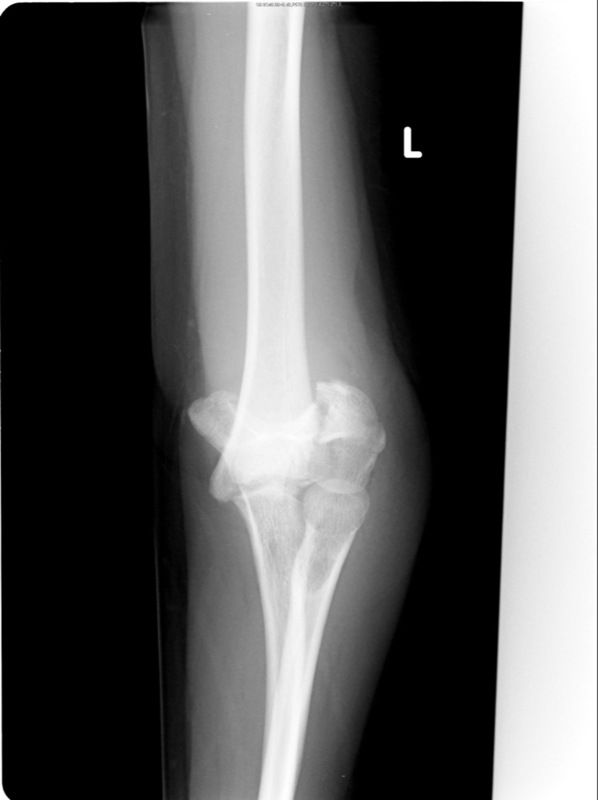 As the radius and ulna are a ring structure, if one displaced fracture is seen, another should be sought. The second injury may be a dislocation. 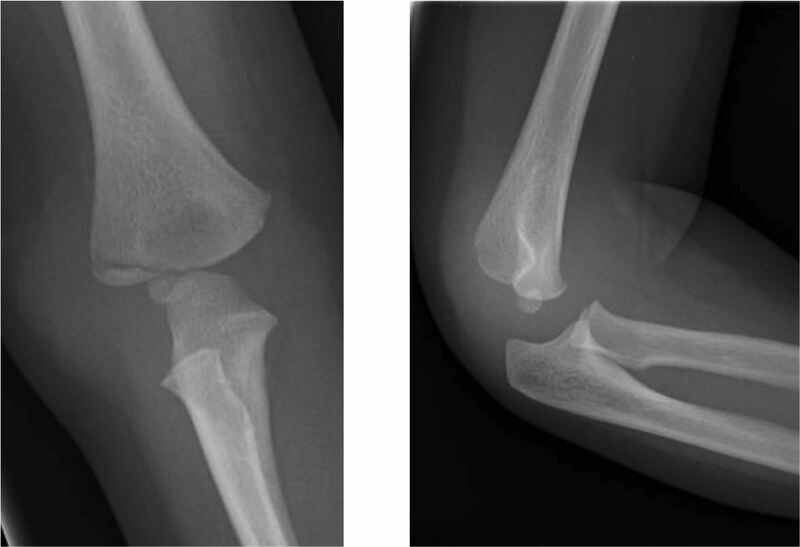 The Monteggia fracture-dislocation refers to a fracture of the proximal ulnar shaft with an associated dislocation of the radial head. This can be identified by drawing the radiocapitellar line. 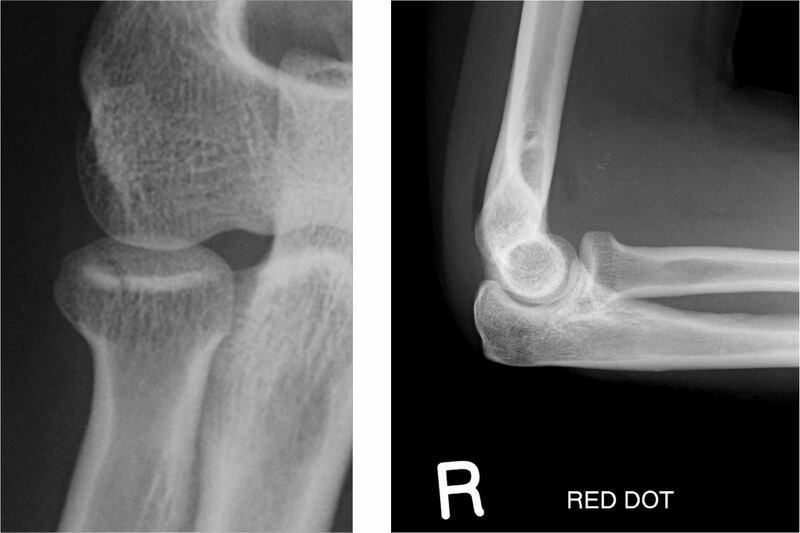 A similar fracture-dislocation may be seen distally at the wrist (Galeazzi fracture-dislocation) where a fracture of the distal radius is accompanied by a dislocation at the distal radioulnar joint. Although not very common, this is a significant injury in children and must not be missed. 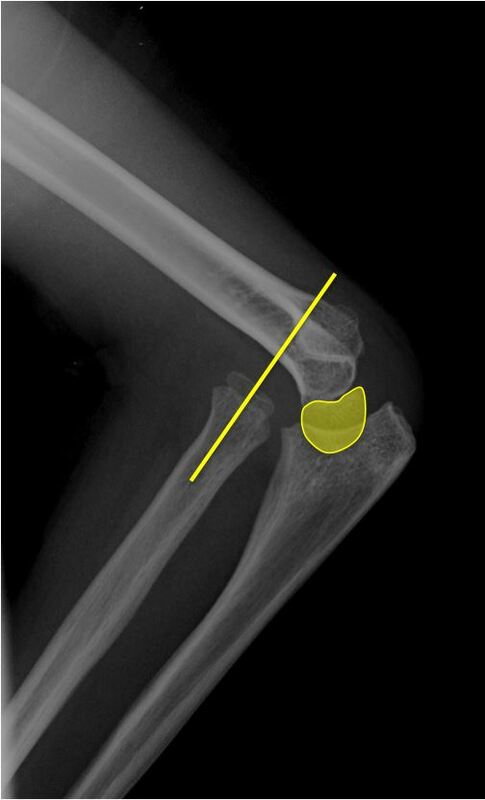 The medial epicondyle is the third ossification centre to appear at the elbow and the last to fuse. 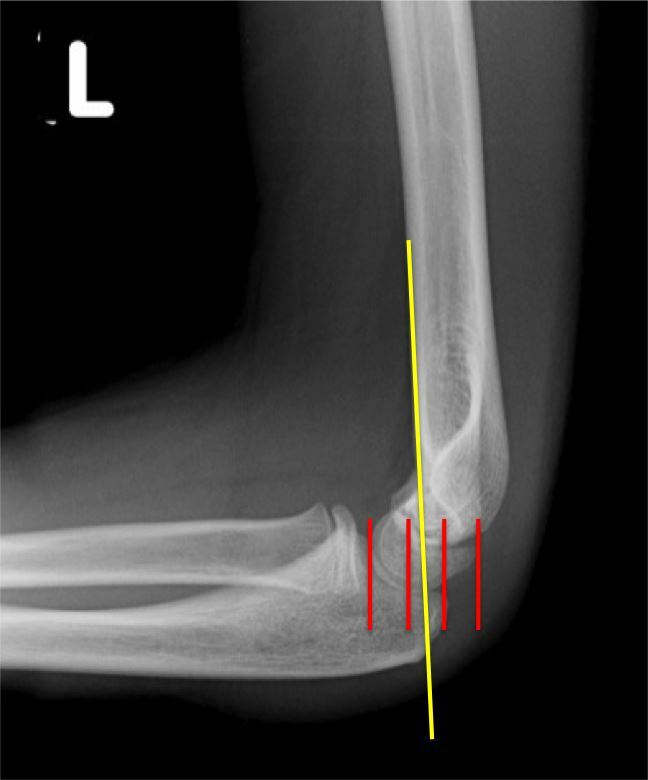 by contraction of the forearm flexor muscles that originate on the medial epicondyle. This commonly occurs whilst throwing a ball, thus avulsing the epicondyle. There may be varying degrees of displacement. 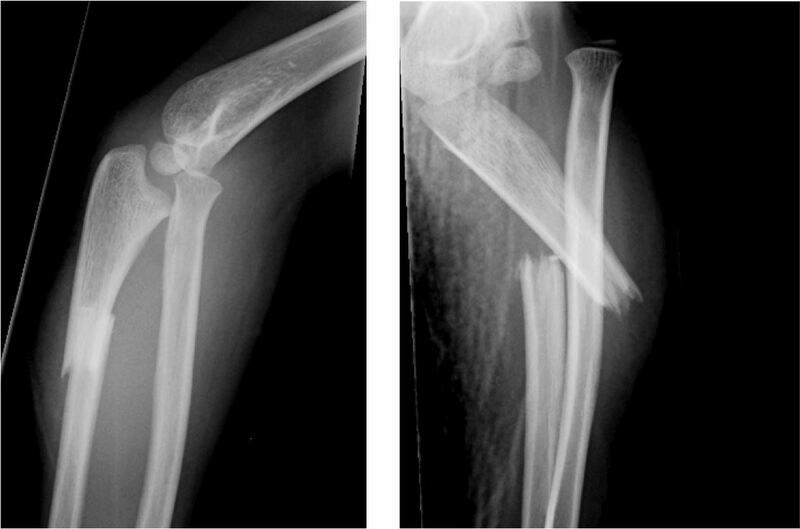 Minor displacement inferiorly can be more obvious than major displacement. If the ossification centre is greatly displaced, it will lie within the joint where it may be mistaken for the trochlea ossification centre. This is when knowledge of the correct sequence of appearance of the ossification centres is important and the mnemonic CRITOL is useful. 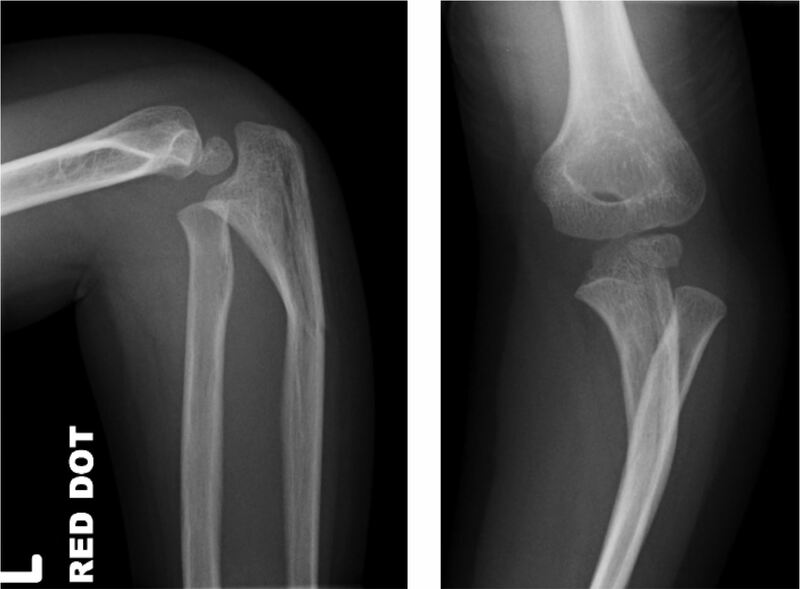 If the ossification centre for the trochlea is seen but the medial epicondyle is not, an avulsion of the epicondyle must be suspected. 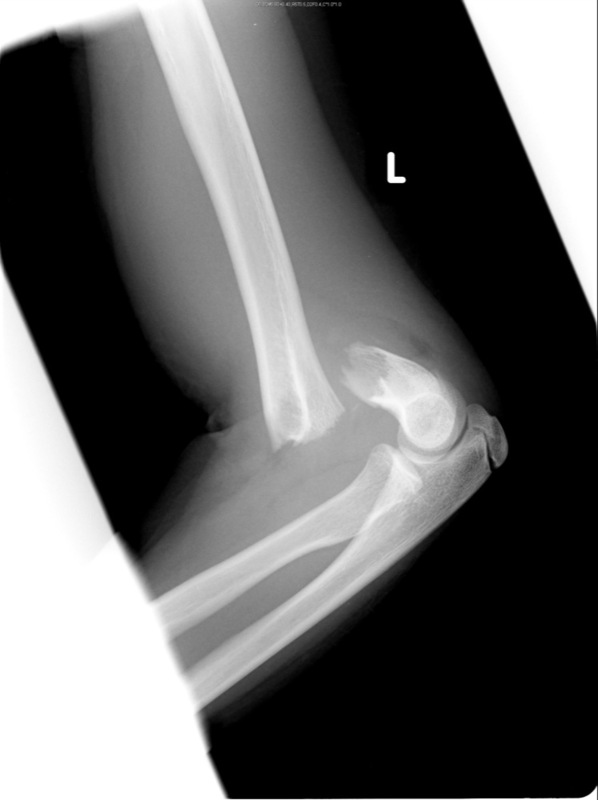 This is one of the most common elbow injuries in younger children. A sudden pull on the hand causes the radial head to be subluxed distally beneath the annular ligament, which becomes entrapped within the joint. This entrapment causes the child to hold his forearm in midpronation. Treatment is simply supination of the forearm, which returns the ligament to its normal position. Radiography is not indicated.